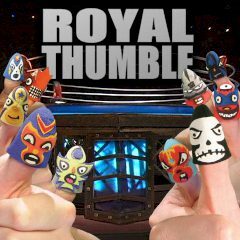 Choose the ultimate thumb wrestler and beat your opponent in the wrestling match. Click on the icon to show what move you want to make and compare it to the opponent's. Make sure that you combination beats another! Do you like wrestling? Many people are fascinated about it, but that seems not enough for them. To fill the gap, they've made the Thumb Wrestling Federation and each thumb could become a champion. Wear a mask to startle the enemy and choose the winning combination to smash the thumb of your enemy!